All of my Disney thoughts including old movies, new movies, and parks info! The Frozen girls- Anna and Elsa- have moved into the Fairytale Hall of New Fantasyland in the Magic Kingdom. This means (hopefully) the end of the Daddy Dash/Frosen 5k, when guests would run to the Frozen Meet’n’Greet immediately after the drop. However, the wait times have only slightly improved. When the girls were back in EPCOT, it was a consistent 4 hour wait. Check out this graph that gives estimated times based on previous days. It seems that from opening to close, guests will have to wait roughly 3 hours to see the icy ladies, whereas the wait times for Cinderella and Rqapunzel never exceed 45 minutes. Yet there is still hope for those who play it smart! The benefit of the royal ladies being moved into Fairytale Hall is that you are now able to book a fastpass for the attraction through both the WDW website and the My Disney Experience app. Thank goodness for fastpasses, this will automatically push you to the front of the line. The best part? Fastpass+ is available to any guest with a valid park ticket. Well, hopefully the hype will die down soon. But between the merchandising fiasco, Disney’s plans for Frozen on Broadway, and possibly a sequel, I doubt it will. This entry was posted in Disney Parks, Frozen, Magic Kingdom and tagged Anna, Aurora, Briar Rose, Disney, Disney Princess, Disney World, Elsa, FLorida, Frozen, Magic Kingdom, MK, Orlando, Princess, Princesses, Sleeping Beauty, Theme Park, Walt DIsney World, WDW. Bookmark the permalink. There is a new creature walking around Animal Kingdom these days! On May 3rd, V the velociraptor was spotted being walked through the park by Professor Parker Woodson. DISCLAIMER: This is only a test run by the parks and certainly does not mean that the character will be permanent, or even out ever again. V is a latex/rubber dinosaur moving by the man operating it underneath. Its tail wags and there is a consistent screeching noise made. He also can smell, lean down, as well as look around. To me, this dinosaur just seems poorly planned. He walks horribly awkward and always seems to be looking down. It was clearly not ready for a test run! The man controlling the dinosaur is very obvious to anyone over the age of five. For those under that age, however, the dino is quite scary. In some videos there are children running, crying, and screaming due to this velociraptor. Two cast members (besides Prof. Woodson!) have to trail behind the dino to prevent its tail from smacking into guests. The most disappointing part about this dinosaur fiasco is that back in 2003 Disney released a dinosaur named Lucky who was completely animatronic, meaning that there was no human operating him. He pulled a cart, blinked, walked, and could even sign autographs! Occasionally he was known to steal a hat off of a kid’s head. Clearly Lucky has some problems that prevent him from being shown in the park on a daily basis (possible dangers or high operating costs? ), which forced Disney to come up with a new solution. The fact that Lucky was released nearly 10 years ago and is vastly better than V shocks me. Of course it’s just a test, so we’ll have to wait and see. I’ve included a video of each dinosaur below for you to compare. What do you think about these two Disneysaurs? This entry was posted in Animal Kingdom, Disney Parks and tagged AK, Animal Kingdom, Dinosaur, Disney, Disney Parks, Disney World, Velociraptor, Walt Disney, Walt DIsney World, WDW. Bookmark the permalink. The Disney company owns a huge section of land in Florida. Much of it is used as a park or resort, but there are a few undeveloped areas. Even lesser know, there are some areas that were once a park and now completely abandoned. 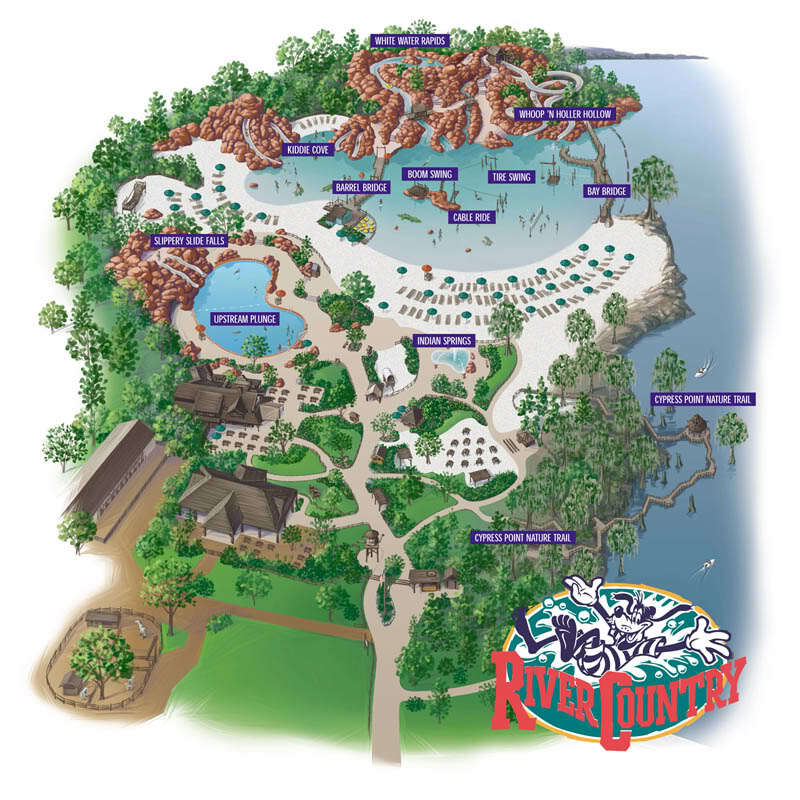 The two parks are Discovery Island- A natural habitat and wildlife preservation for exotic creatures- and River Country- an “old fashioned swimmin’ hole” waterpark. Originally Treasure Island, Discovery Island closed in 1999 soon after Animal Kingdom opened, likely because there was no need for two wildlife based parks. Before it’s closure five Disney employees were charged with several counts of mistreating animals. There was even a cage in which nineteen vultures were left to die without food or water. I recommend you read Shane Perez’ blog post on his adventure into the abandoned park. Preserved snakes… with one in a Diet Coke bottle? River Country opened in 1976 as Disney’s first water park, then closed in 2001. Walt Disney World has never given a reason for the park’s closure, however one employee says that one morning they had to delay opening the park due to an alligator in one of the pools. Another likely reason is the discovery of brain-eating amoebas found in the water. Being infected with this almost always leads to death. Seeing these photos makes me think- if I were older, someone who had visited and enjoyed these parks, seeing them in this wretched state would depress me. These parks were once popular attractions. Now they sit in ruins. So what do you think Disney should do with the land? This entry was posted in Disney Parks and tagged Abandoned Places, Discovery Island, Disney, Disney Parks, River Country, Walt DIsney World, WDW. Bookmark the permalink. The Festival of Fantasy Parade has arrived! Wow, the first new parade in over 10 years! Disney recently retired Celebrate a Dream Come True (RIP) in order to make way for the new parade, Festival of Fantasy, which held its debut yesterday (March 9th, 2014). It was amazing and the floats were truly a spectacle. Many of the Disney revival princesses were to be seen with their own intricate floats, with dancers in all new costumes. Firstly, the Beauty and the Beast float was lead by the crazy swan people, which confused me. Where there swans in that movie at all? Odd. Quiet, classy float. Nothing too special. Cinderella and Charming arrived in typical fashion, nothing new to note about their outfits. However, I did find it strange that they made such a spectacle of her pink dress. The float spins around to reveal Cindy’s pink dress. This Frozen float is absolutely amazing!!! Anna in her coronation dress??? I love it! And her hair looks stunning, perfectly natural. That little Olaf spins and moves beautifully as well. Elsa is elegant and regal as usual. I just can’t get enough, I love that they included these girls in the parade even though they’re so new to the Disney universe. This is my favorite float of the parade by far. It’s huge, it’s amazingly detailed, and it’s got characters spread throughout it. If you look closely you can see Flynn Rider and other guys from the Snuggly Duckling on one of the swinging axes. Tell me that doesn’t seem like a fun job to have! And I love the Rapunzel’s hair leads through the entire float. So many easter eggs hidden in this float! The only thing that ruined it for me was the costumes of the dancers. Just hideous! Are they… rainbow viking renaissance girls? I found the many of the general dancers had these crazy costumes that just seemed like a child threw on every colorful thing they could find. 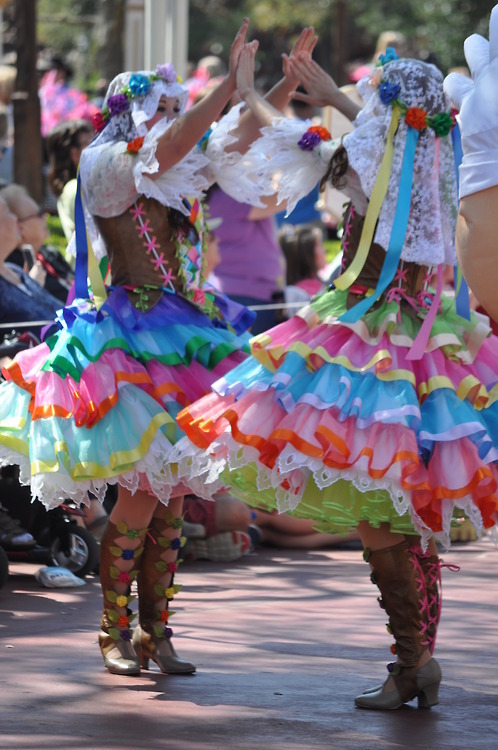 Take a look at other dancers over at Stitch Kingdom. The Malificent float was by far the most thought-out and detailed part of the parade. She was led by three very worried fairies, along with Prince Philip, fighting her off. This float was very dark compared to the other floats, possibly to make us think of the new Malificent movie coming up. The crown jewel of the parade. Why is this so enormously tall? And finally the parade wraps up with a garish Pinocchio float, a cast of miscellaneous characters and a lovely little Mickey Mouse float. 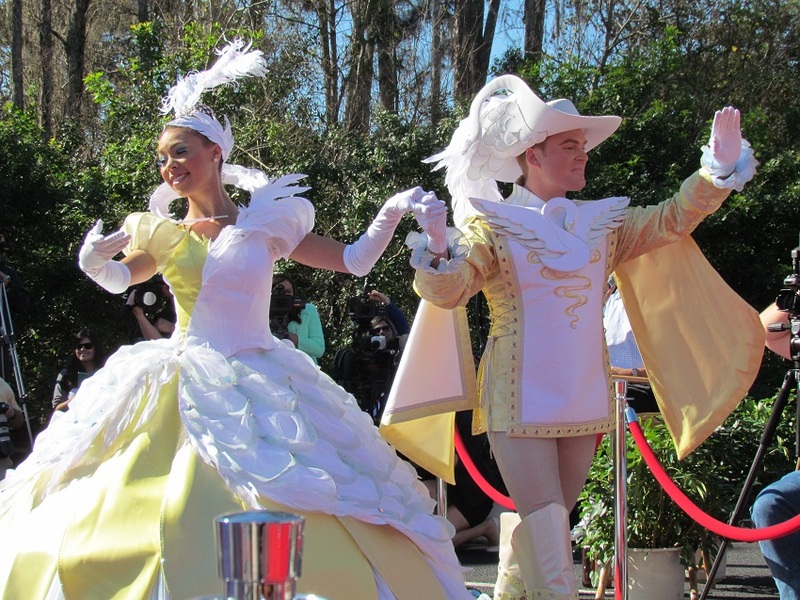 What do you think, was the parade a true Festival of Fantasy or a Funeral of Gaudiness? This entry was posted in Disney Parks and tagged Anna, Ariel, Beauty and the Beast, Brave, Cinderella, Disney, Disney Festival of Fantasy, Disney Parade, Disney Parks, Disney World, Elsa, Festival of Fantasy, Frozen, Malificent, Merida, Mickey Mouse, Minnie Mouse, Parade, Peter Pan, Rapunzel, Sleeping Beauty, Tanlged, The Little Mermaid, Tinkerbell, Walt DIsney World. Bookmark the permalink. Walls down on the Mine Train. For most of you, myself included, this is old news. However I still wanted to post on it because there are several pictures you might want to see. Firstly though, for those who may not have heard about it: The Seven Dwarfs Mine Train is a new ride currently under construction in New Fantasyland. It sits next to Belle’s village and until February 11th there where walls around the ride, with only small windows for guests to take a sneak peek. It has been under construction since 2012 and Disney has released a few pictures of the view from the top of the ride! Overlooking Belle’s Castle and Village. 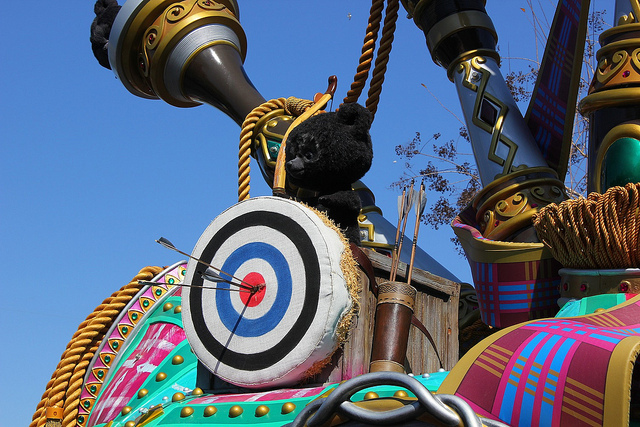 The parks have also released some detail shots. A few avid fans were lucky to grab a few shots on the day the walls went down. Tell me that dip doesn’t look fun! Love the waterfalls as well. Looks like it might be fast, exciting, but still good for little kids. Soft openings for the ride are likely to be held sometime in May, though Disney has released no opening date yet. It seems they still have much to accomplish on the ride before it is ready, considering that construction workers are consistently walking busily around the ride. I wonder if Snow White will be mentioned, especially after the closing of Snow White’s Scary Adventures. So what do you think? Do you plan on riding it your next trip? This entry was posted in Disney Parks and tagged Attractions, Disney, Mine Train, Ride, Snow White, Theme Parks, Walt DIsney World, WDW. Bookmark the permalink.